It’s St. Patrick’s Day in Dublin. I walk through the massive crowd decked out in every imaginable piece of Irish paraphernalia; green, green and more green! I enter Davy Byrne’s pub, just off Grafton Street and I wonder just how good that green beer will taste when imbibed on the Emerald Isle itself. 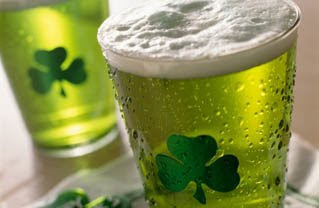 I approach the bar and order a lager, colored with green food coloring to produce a green foamy libation. I accidentally bump another patron; I apologize and wish him, ‘Happy St. Patrick’s Day’. I was kindly corrected, ‘we say Paddy’s Day, Happy Paddy’s Day.’ We clink glasses and he says, ‘Sláinte’ which is an approximation of cheers in Gaelic. Ever wonder how green became the color of St. Patrick’s Day or why the shamrock symbolizes Paddy’s Day revelry worldwide? Why is it a holiday in the first place and why is March 17th recognised around the world as a day to drink beer and pinch people not wearing green? My 2007 trip to the Dublin Paddy’s Day celebration provided some interesting and valuable insights. Paddy’s Day is about much more than Guinness and mindless alcohol-fuelled debauchery; though these days that’s a big part of it too. The holiday is celebrated on March 17th every year to commemorate the life of St. Patrick, the patron saint of Ireland, who died March 17, 493 A.D. St. Patrick was credited with bringing Christianity to the pagans of Ireland. He used the shamrock, a three-leaved green plant, to relate the holy trinity. Over time, both the color green and the shamrock became world-wide symbols of the Irish and of St. Patrick’s Day. But why do you get pinched if you forget your green on Paddy’s Day? This painful tradition was started in America by Irish immigrants in the early 1700s. It was thought that wearing green protected a person from the mischief of leprechauns. By pinching those around you not wearing green was a superstitious warning. If you don’t like beer you may get more than pinched. Beer is another ubiquitous symbol of Paddy’s Day. Historically the Irish people celebrated the day of their patron saint by attending Holy Mass in the morning and enjoyed a feast of Irish bacon and cabbage in the afternoon. Furthermore, people celebrated by drinking ale and over the years, beer became a traditional way to celebrate the holiday. Because St. Patrick’s Day falls during Lent, people considered the feast day a reprieve from Lenten fast which often resulted in over-indulgence, thus creating the tradition to get ‘fluthered’ (Irish word for very drunk). In the mid-1990’s the Irish government began a campaign to use St. Patrick’s Day to promote tourism and showcase Ireland and its culture. Since the first St. Patrick’s Day Festival in Dublin in 1996 it has become a three day event of parades, outdoor concerts, theatre performances, and fireworks. It is one of the world’s best parties and a place where hedonism meets religiosity. The Paddy’s Day parade in Dublin is truly a sight to see. Ornate floats, flamboyant dancers, talented marching bands, 4,000 performers, and over one million spectators come together to create one of the most incredible sights I have ever seen. People line both sides of the city centre streets to watch the festivities. Because it’s impossible to see the parade on the street behind hundreds, or in some cases thousands of people, inventive people employ the tops of phone booths, ladders, towering fountains and stone monuments to get a better look. Not only do they get a better look but they remain dry as many others plod through bubbly water. Pranksters fill the many city fountains with soap which creates a sudsy tribute to Paddy and the day of celebrations. Dublin is one of the most youthful cities in Europe, 50% of the population is younger than 25. What's more, in 2007 and again in 2009, Dublin was voted the friendliest city in Europe. You can only imagine how rowdy things get on the biggest party day of the Irish social calendar. My husband and I hopped from one pub to another to another, rubbing elbows with ‘Irish’ people from all over the world. Some pubs pour their Guinness and top it off with a shamrock design in the foam, others write your name in the head. It is a celebration where every-day pretentions disappear, people proudly sport their green leprechaun hats and Irish flag feather boas and the objective of the night is to have fun, fun, fun! Though the Paddy’s Day festivities in Dublin are phenomenal, I can’t say the celebration is out of the ordinary as far as St. Patrick’s Day celebrations go. It seems whether you live in the USA, Canada, Australia, New Zealand or anywhere else where there are a significant number of Irish descendants- the party on March 17th is always hopping. While the tradition to celebrate St. Patrick was brought abroad by Irish immigrants, the customs have been widely welcomed by people of all ethnicities. The Irish know tradition, they know fun, they know camaraderie, they know their drink, and that is why on March 17th everyone wants to go green and feel Irish.